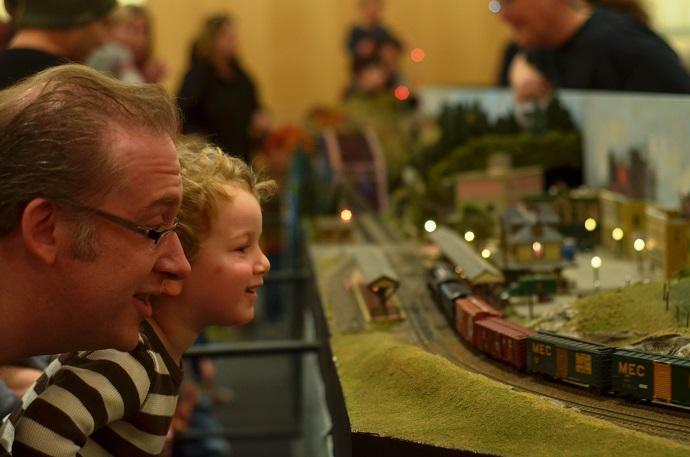 Father and son, Jeff and Jakob Croteau, admire a model railroad at the Scottish Rite Masonic Museum and Library. The Scottish Rite Masonic Museum and Library will host its annual Model Train Weekend on Saturday, Dec. 16, and Sunday, Dec. 17. The museum is at 33 Marrett Road in Lexington. The Hub Division of the National Model Railroad Association will present model trains running on multiple lines as they chug up mountains, past coal mines, and through small snow-covered villages. The family-friendly event is open for adults and children of all ages. The model train weekend hours are 10 a.m. to 4:30 p.m. on Saturday and noon to 4 p.m. on Sunday. Admission is $7 per family and individuals cost $5 each. Museum members and members of the Hub Division will be charged $4. For more information, call 781-861-6559 or visit www.srmml.org. The Ashland Documentary Film and Discussion Series will show the film “Generation Zapped” on Thursday, Dec. 14, from 7 to 9 p.m. The event is free and the film will be shown in the Community Room of Ashland Library at 66 Front St. The film will be followed by a question and answer session with Cece Doucette, an Ashland resident who works with Wireless Education, an organization that strives to ensure safe technology usage. Doucette appears in the film to discuss a precautionary sign that the Ashland School Committee posted in each of the classrooms to reduce technological risk exposure. For more information about the film, go to www.generationzapped.com. The Shops at Chestnut Hill will be hosting a Hanukkah Celebration on Sunday, Dec. 17, from 2 to 3:30 p.m. The celebration and menorah lighting will take place on the lower level of the center court. Rabbi Mendy Uminer of Chabad at Chestnut Hill will lead the proceedings. For more information, call 617-965-3038.